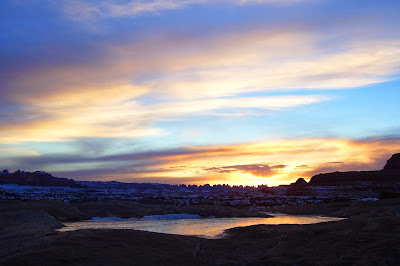 Frozen kettle ponds of melted snow adorn the redrock near home. Canyonlands National Park, Utah. Crepuscular means to be active at dawn and dusk, like a bobcat, a puma - a creature of stealth, alert and watchful. Here in the desert, the dawn of the day and the long finale of twilight are my cherished moments. 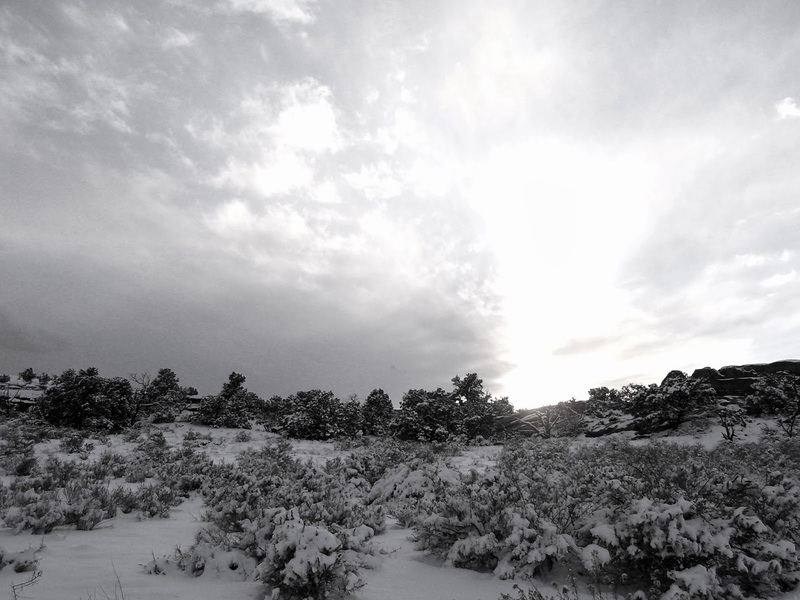 I've accepted an invitation to create art in Canyonlands National Park for one solitary winter month. It's currently the off-season and the world rings with silence. Snow has settled like a thin blanket over the redrock and the stillness is absolute. I am loving it. My greetings to dawn and dusk are a salutation to earth: thank you. This morning I rolled out of bed to walk under the stars before the sun before the ravens before I was really even awake, the frigid-oh-my crackle of ice and frozen desert grass under my boots. Orion overhead, North Six Shooter on the eastern horizon, gaining light. Here: a spaciousness as wide and deep as my heart, a place called home. Twilight is the bright, sparkling in-between time, and I understand how comfortable I've become in this. In transitions of space and seasons, I finally relax into the mystery that threads all of creation together. I'm reminded that I am - we are- so small and fragile, yet as unbounded as clear luminous light. To be fragile: Little Auk rides swing in a storm! 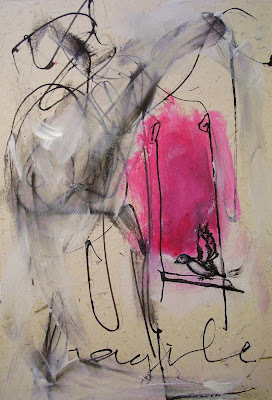 India ink and acrylic on paper. Late night, before bed, I step outside into the darkness to listen to the desert, my ears straining to hear something. Only this: the sound of my own heartbeat thrumming in my ears. The faint hum of life beneath the noise. The sound of a planet at rest. There is a parallel to this open canyon country and the Arctic. Both speak to me in the same language. Both describe a prevailing natural rhythm where stars take the place of street lights and the illuminated glare of big box stores. There is a timelessness here that captivates me daily. I fantasize about never leaving. In the act of making art exists this same expansiveness. Writes Terry Tempest Williams in her book, When Women Were Birds, "Creativity is another form of open space, whose very nature is to disturb, disrupt, and bring us to tenderness." Yes, I think. YES. 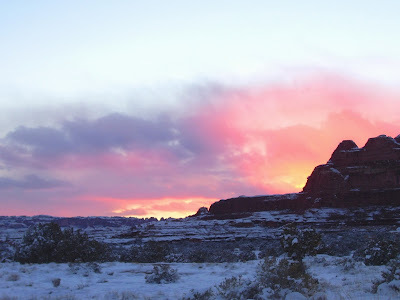 A dusting of fresh powder near the house, and a brand new day at Canyonlands. in her sweater of white.